Who doesn’t love a holiday-themed Supernatural episode? “Love Hurts” is all about the dangers of desire and love. Acting on your deepest desire could result in your heart being ripped out. Happy Valentine’s Day! In the world of Supernatural, Valentine’s Day can result in a visit by cupid, flowers, romantic dinners, or a blood-red death. Or all of them, consecutively or sequentially. When a babysitter pines for a cheating husband who won’t leave his wife, she finds her heart torn out, literally. It turns out Valentine’s Day went better for some. Dean spent his Valentine’s Day out on the town playing “Mr. Right Now” for the ladies, while Sam found the heart-ripping case that would take up the rest of the episode. The boys head off to Hudson, Ohio. If the Winchesters had bothered to look at the city’s website they could have joined in Random Acts of Kindness in Hudson, a series of events scheduled to begin on Valentine’s Day. Sounds like an awesome town. Sam and Dean interview the not-so-happy couple, Dan and Melissa, about the death of their babysitter. The interview doesn’t go far. Even Sam’s visit to the morgue doesn’t turn up much, except a strange hole where the babysitter’s heart used to be. Dean follows up with a private interview of Dan, the suspicious-acting husband. Dan shows Dean the nanny cam footage of what appears to be Dan ripping out the babysitter’s heart at the same time he was at dinner with his wife. Sam and Dean figure they’re dealing with a shapeshifter. Later the creature comes for Dan at his office, ripping out his heart as well. Sam and Dean suspect the wife Melissa, but she passes the silver shapeshifter test. After they leave, Melissa opens a box filled with witch paraphernalia. It turns out she had cast a spell and it backfired. So much so that her dead husband comes for her later that night. Her own murder can’t be what she had planned with that spell. Love doesn’t just hurt, it tends to spiral out of control. Melissa manages to run away, making her way to the Winchester’s digs– the Too Tired Motel. Since their bunker lifestyle reduces how many motels the boys stay in, we’ve really been missing these fantastic sets. This one is a-mazing, and not just because of the cool name. It’s decorated with Valentine’s Day red and has little Hudson Tires decorating the divider. It just has a great look. The Supernatural set designers are the best in the television business. Melissa tells the Winchesters that her dead husband is chasing her. She confesses that her hairdresser claims to be a “white witch” and gave her a spell to get her love back. But her love spell was really an Aramaic curse – the kiss of death. Sam and Dean realize the curse is transmittable –like an STD. Very appropriate for Valentines’ Day. Creature Dan crashes through the window to take his revenge on the original curse caster, Melissa. Dean shoots him full of silver, but it has no effect. He decides to protect Melissa by kissing her, so the curse is transferred to him. As creature Dan begins to focus on Dean, they manage to get to the Impala and escape. Sam isn’t happy about Dean taking on the fatal curse to protect Melissa. Sam tells his brother that he doesn’t have to be a martyr, he doesn’t have to carry the weight by himself. Is that what Dean’s been doing? Melissa learns the Winchesters are hunters when Sam and Dean stop to grab weaponry out of the trunk. Nothing like seeing two men you barely know have a trunk full of extremely dangerous weapons to make you feel secure. The three of them head to the witch’s basement salon–The Art of Dyeing. Melissa is left in the Impala with a knife to defend herself. Melissa doesn’t think she could stab anyone, but Dean tells her, “She is a wicked witch who off’d your husband and tried to kill you, so if she shows up here, you punch her, you stab her, you drop a freaking house on her if you have to.” The house bit would, of course, only work for witches from certain points of the compass, but it was a good pep talk. Sam and Dean break into the house and make their way to the basement. Sam finds a book of magic filled with post-it notes. He finds the spell and learns that the monster is a Qareen–“a creature corporeal in form, a slave to commands.” It takes the form of your deepest darkest desire. We’re pretty sure we know who is coming for Dean, and it’s not Daisy Duke. The brothers do Rock Paper Scissors to decide who’s going to go upstairs to search for the heart. Dean actually chooses paper instead of scissors, and wins for once, so Sam goes upstairs. Who says the Winchesters always repeat the same mistakes? Once upstairs, Sam starts making way too much noise. He finds the heart, but not before the witch finds him. It turns out that the witch is all about punishing cheating men. She tells Sam about her evil plan, how she tweaked the curse to punish not only the cheaters, but the women foolish enough to take them back. In the basement, Dean can’t help his brother because Amara has just shown up. Well, it’s really the Qareen, but it sure looks like Amara. The creature tells Dean that it sees the love for Amara inside his heart, though it’s cloaked in shame. He should be ashamed. He admits that the real Amara does have a hold on him, but the Qareen is nothing but a cheap imitation. The creature attacks Dean. Upstairs, the witch has finally finished her speech and begins to cast a curse on Sam. Luckily Melissa comes in with her knife and tells the witch “Please, enough is enough,” giving Sam enough time to finish the job with the insufficiently named witch killing bullets. Seconds before the Amara Qareen punches a hole through Dean’s chest, Sam manages to stab the heart he found earlier, saving his brother. Well there’s something different. 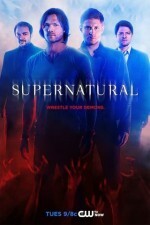 Normally, Sam is being strangled by someone or something and Dean has to save his brother from monster murder. When they get back to the hotel Sam wants to know who it was that attacked him. We steel ourselves for the typical Winchester lie, but miracle of miracles, Dean finally tells his brother the truth. Who says an old dog can’t learn new tricks. Though we didn’t anticipate Dean’s honest response, Sam isn’t surprised at all. The writing team of Eric Charmelo and Nicole Snyder give viewers a refreshingly open and direct dialogue, as Sam tells his brother that his connection to Amara doesn’t make him evil or weak. After Dean leaves the motel room, Director Phil Sgriccia gives us an extended shot of the anguish on Sam’s face and then the amazing hotel room. Jared Padalecki has been on fire with his acting during Season 11, and it’s in quiet moments like these that he’s at his best. As well as the strong writing, it’s all the details of “Love Hurts” that draw us in. The red theme throughout, the sound of someone’s heart being punched out, the train whistle, the motel room, the shadow of Dan in the hotel room turning into Amara, the spell book and so many others that add depth to the episode in the way that only Supernatural does. In “Love Hurts” Supernatural gives us a complex Monster of the Week episode, while also connecting to the season’s overall story arc. A shapeshifter red herring, witchcraft and a Djinn-like creature that takes the form of your deepest desire makes for a pretty great monster story. Connecting an already interesting monster hunt with the Amara storyline worked well. Amara is as powerful as God, so we can’t just have her showing up in person every other episode. Wait, has she already been in every other episode? Well, technically, she wasn’t in this episode. Nevertheless, having a representation of Amara appear as Dean’s deepest desire enhanced an already good story. We can see why Dean is so obsessed with Amara because Emily Swallow is kinda hypnotizing on screen. Though we weren’t surprised that Amara showed up as Dean’s deepest desire, we didn’t expect Dean to tell his brother the truth. What a relief he finally did, though. Having Sam respond so gracefully was another nice change. In “Love Hurts” Supernatural gave us no wringing of hands or accusations, just honesty and support. Who are these Winchesters? We kinda like ‘em. I completely agree with you about the set designers being the best in the business — the level of detail in the Too Tired Motel, from the logo’d wallpaper to the Hudson Tire room divider (with tire iron connectors!) was simply delightful. I swear the work these folks do is the most underrated part of the work in front of the camera. They are so talented. The motels, the bars, the bunker and more. Such attention to detail. The props are amazing too. Crowley gets some great props – the skull topped glass vial he filled with angel grace in Soul Survivor and his pitchfolk drink stirrer in Inside Man. They are an impressive team and it shows.